Thank you very much for Redmine and plugins and patches. I am one of the Redmine User's Group management staff. 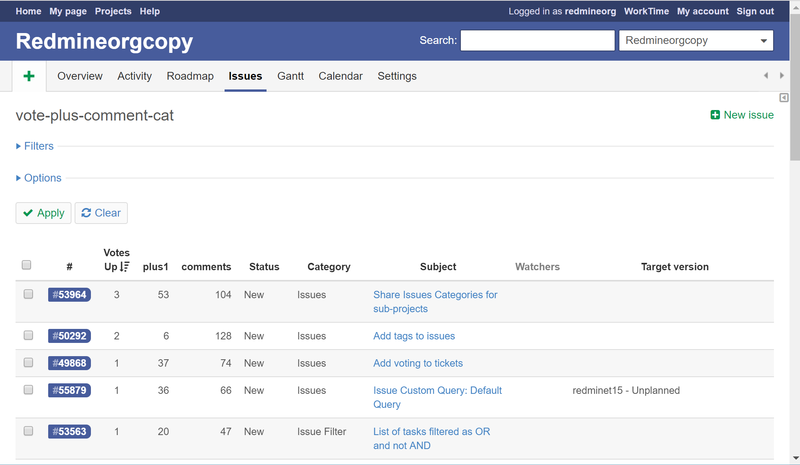 In order to use redmine more conveniently, we investigating remodeling and patch information in our community site. There are many unused tickets in redmine.org website. there are many points to be helpful and there are also people who need it. The author's thoughts also exist. But it is difficult to find , then difficult to utilize. I want to honor those tickets. I arranged in order of the number of votes , making it easier to find. I hope this list will be useful. If you agree with the list of ticket contents, please write + 1 comment to ticket. I think this and the other extended lists are an awesome source for finding the interest of the community. As such they are, I think, a very valuable contribution. Thanks for creating and sharing them. Note: I'll set this topic to be sticky so it becomes easier to find. Mischa, thanks for your comment and setting sticky. I will post other lists , in a few days. I hope everyone will be useful. Yuuki NARA, thanks for creating these lists and for sharing them with the community. I'm wondering if it's easy for you to update these lists? I'm asking because Redmine 3.4.0 closed some of the most voted tickets. How about with the following correspondence? I will delete items completed in 3.4 from vote count list. I will not delete items completed in 4.0 . Because it can not be used yet. After Redmine 4.0 is released, i will Update the whole list. Sounds good for me. I thought that you use a script or something like that to generate the reports, but if is only manual work, don't bother too much. I deleted items completed in 3.4 from vote count list. Most of the work is scripted. See Feature #17288 Use Watcher Count as a poor man's Voting system on redmine.org for a description of a simple implementation. This woukd make it transparent, and avoid the +1 spam. @go2null A voting plugin is available, too and the original issue #1011 will have its 10th anniversary in April this year. It seems, there aren't many dwarfs left in the halls of Moria to hear your suggestion. Perhaps you would have more luck in the #IRC channel. I updated vote count list. This list is 2018 New Year version. I will update this list,when Redmine4.0 released. I separated one thing with +1 more than five and 1-4 things. 1-4 cases were sorted by category first, sorted by number of votes and update date and time. · There are many proponents who have more than 5 cases, and it seems necessary to judge the contents on a case by case basis. · It is easier to correlate in categories than one difference. I discussed with Go.MAEDA and created note count list too. The number of issue comments express the lively activity of the discussion. It is considered to be an index of interest concerning the contents of the issue. Recently I started working on plugin that allows to vote on issues by sending crypto tokens. This way people can not only show interest in resolution of particular issue, but also incentivise it. I would be happy to work on it further if there is interest. 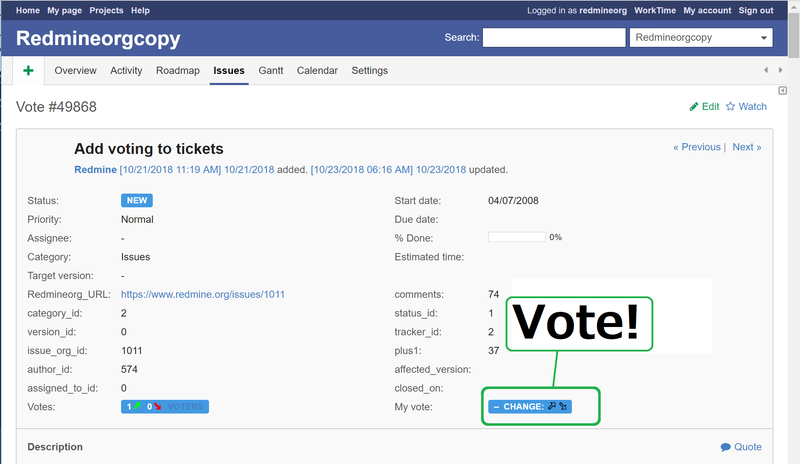 I created a prototype site of the ticket voting function of the Redmine.org site. I will let it run during November. The contents I carried out are as follows. Gathered plus 1 of the existing ticket. For the Vote function, we used the following plug-in. One downside of such solution is that people can be motivated to create multiple accounts to upvote tickets of their interest/downvote others. However, it is still possible to increase the number of Votes by using multiple IDs, even now. This method can be easily executed, and fairness among tickets can be secured. Please tell me if there is any other good way. I'm not saying that this method is inappropriate for Redmine. It may work depending on community culture. I think that robust voting system should rely on some scarce resource to provide reliable results. Voter identity ('account') is to some degree scarce - as it requires time (which is strongly limited) to create additional identities. Still the relatively short time needed to create identities may set this price on too low level. Best idea that I can think of at this point is to vote with crypto tokens (given that they are limited or have any economic value). I posted it here in #29758. I also wrote a proof of concept plugin https://www.redmine.org/plugins/token-voting. You may want to have a look if you didn't see it before. It's cool idea, however, it turns a voting system into something more sophisticated than it has to be while also making people deal with bitcoins, which seems sketchy for sure. 1. Easy integration of own reCaptcha via Google to filter bots. 2. Easy integration of own 2FA via Google or MS in the core Redmine, and then to fill phone number and confirm it at least once would need to be required during registration. Then obviously it would then not allow another user with the same phone number. I think keeping it simple as Yuuki NARA suggested in the prototype would be the best.